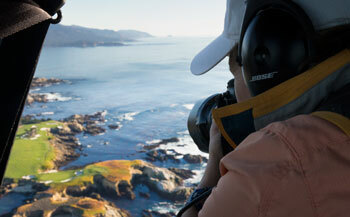 featuring Joann Dost photographs for your next tournament or event. For nearly two decades, we have been crafting tasteful, art-based items for clients to present to commemorate their special outings and events. 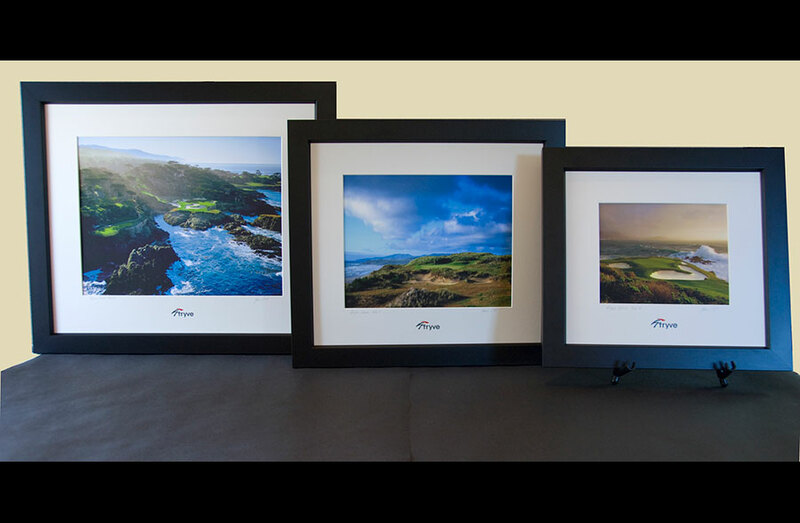 Site specific imagery can be incorporated into our custom-designed selection of prestige gifts for your clients and VIPS. Gift items of distinctive character and lasting impact to distinguish you. Contact us for a consultation so that we may create memorable, quality gifts and awards to suit your timeline, quantity and budget. Hand-painted one-of-a-kind hollow leaded glass spheres feature Joann Dost’s images rendered in three dimensions. 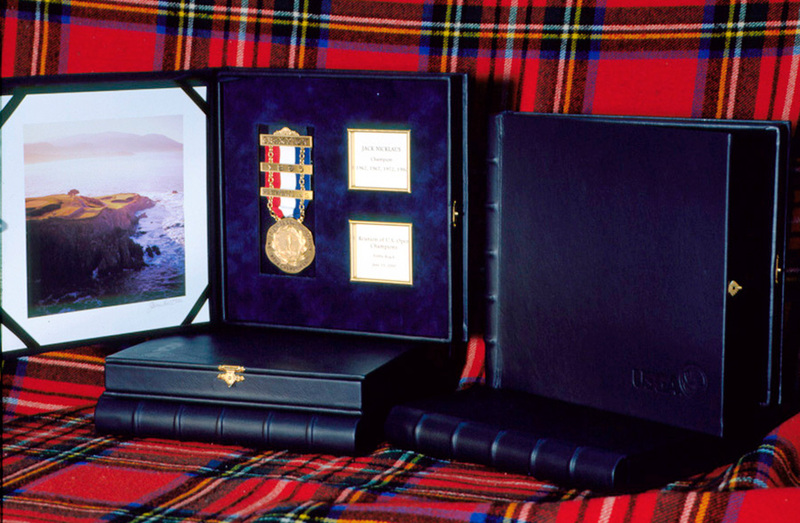 Presented in a black fabric box with Certificate of Authenticity and polishing cloth. Contact us for a custom quote. 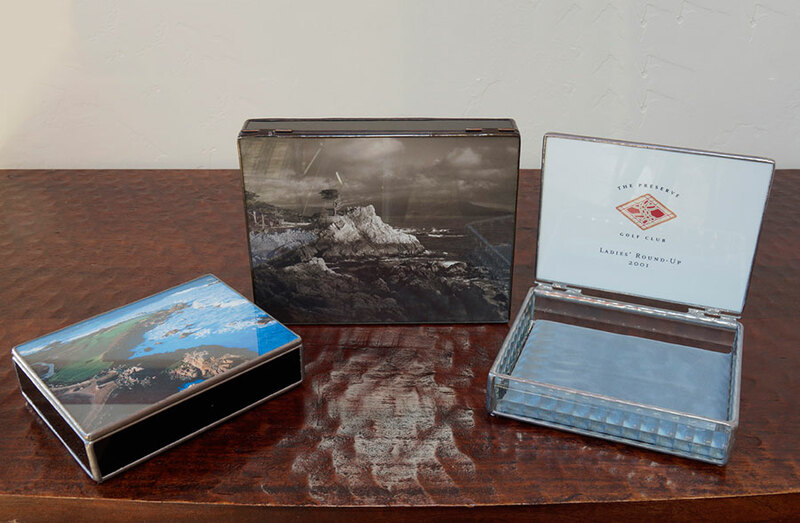 Made by hand in U.S.A., these handsome boxes are available in 5”x5”, 5” x 7” or 7” x 9” and can be customized with Dost image choice, glass siding facet choices, black and white, color or sepia art, lid interior art, laser engraving, and solder color. Contact us for a custom quote. We have collaborated with clients over the years to create dynamic, first-quality, artful gifts, awards and amenities. In 2000, we worked with the USGA to create a commemorative gift for the 100th anniversary of the U.S. Open. They wanted to present a special item to the past U.S. Open Champions. We created a leather folio housing a limited edition Joann Dost giclee print of Pebble Beach Golf Links Hole 7, a replica of the original medallion presented to the winner of the first U.S. Open, and inset details of their name and specific event wins. We look forward to crafting a unique item to exceed your expectations while meeting your budget and timeline. Custom wall art is our specialty. We’ve designed and produced thousands of matted and/ or framed Joann Dost photographs as gifts, awards, amenities and “souvenir art” and welcome the opportunity to design for you. With a variety of print offerings, matted and/ or framed to fit your needs, we are specialists in creating pieces with dramatic impact and lasting quality. From mini to mural, allow us to put our creative skills to work for you. Whether a personal memento gift or a VIP outing amenity, we are sure to create a piece or collection to please every recipient. 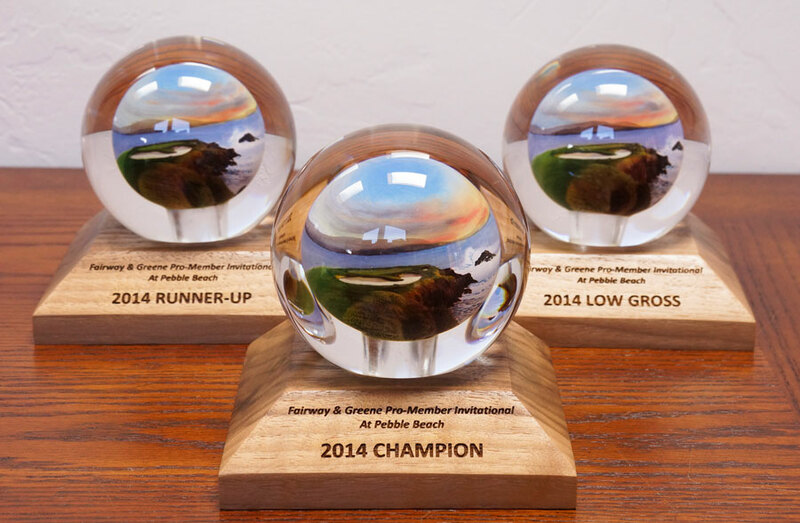 industry organizations, art collectors, tournament directors and individuals. These items have include framed art, glassware, textiles, ceramics and leather goods as well as tableware and published pieces. We look forward to working with you to create something extraordinary for you to present to your clients or friends. Contact sarah@joanndost.com for a consultation.